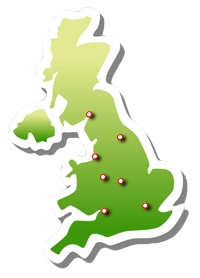 We cover all parts of the UK from John O'groats to Landsend and all the bits in-between! As local topsoil suppliers we have topsoil yards and distribution depots in all parts of the country and can deliver topsoil in bags and bulk bags next day nationwide as well as bulk loads. With topsoil processing and blending facilities throughout the country we supply many grades and types of top soil to house builders, landscapers and gardeners. Below is a list of some of our larger distribution depots and yards around the country. Tired Of Looking For Cheap Topsoil Suppliers Where You Are?